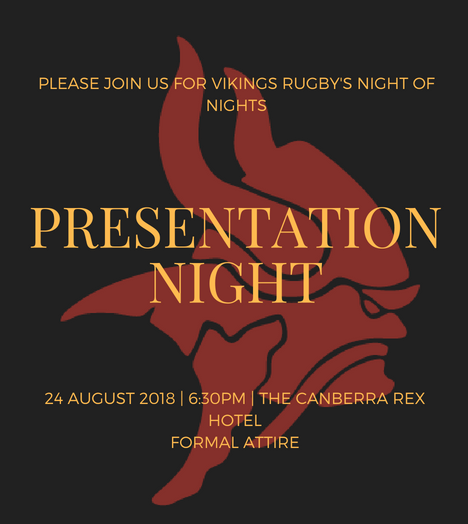 Vikings Rugby’s night of nights, our Presentation Night, will be held on Friday the 24th of August at the Canberra Rex Hotel, from 6:30pm. Presentation Night recognizes those players, volunteers and support staff that have contributed immensely to our Club and our Culture in 2018. It is also an opportunity for the players to reflect on the season gone and celebrate all the successes on and off the field with their friends and families. Our Presentation Night is a ticketed event – your ticket giving you a two course meal*, shared platters and an open bar for the evening. Price and Payment: Click here to purchase tickets. $100 for a Single Senior Player ticket, $190 for a Couples Senior Player ticket.